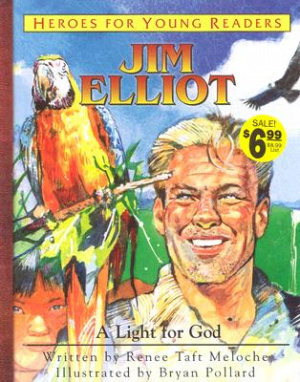 As a boy, young Jim Elliot (1927-1956) dreamed of bringing God's light to exciting and faraway lands. When he grew up, Jim bravely faced both the wonders and the dangers of the South American jungle to share God's love with the feared and isolated Auca people. His martyrdom at their hands ignited a flame for missions that spread to Christians everywhere. Jim Eliott: A Light For God by Renee Taft Meloche was published by Frontline Communications in April 2007 and is our 23166th best seller. The ISBN for Jim Eliott: A Light For God is 9781576582350. Be the first to review Jim Eliott: A Light For God! Got a question? No problem! Just click here to ask us about Jim Eliott: A Light For God.